Manchester United have reportedly joined Chelsea in the race to sign Barcelona star Ivan Rakitic. It is understood the Premier League pair have enquired about his availability and could land the Croatian midfielder for as little as £57million this summer. According to Sport, Manchester United and Chelsea also face competition from Bayern Munich, Juventus and Inter Milan who have all contacted Barca this season. Rakitic, 30, was the subject of a £78m bid from Paris Saint-Germain last summer, which would also have seen his wages doubled. But although the club were prepared to sell, the deal was blocked by head coach Ernesto Valverde and the player himself. This summer could well be different, though, as Barcelona refuse to offer Rakitic a new contract. His current deal expires in 2021 and there have been suggestions he is happy to stay at Barcelona for the rest of his career. However, with no extension or improved wages on the table, the World Cup finalist may be tempted to move on. 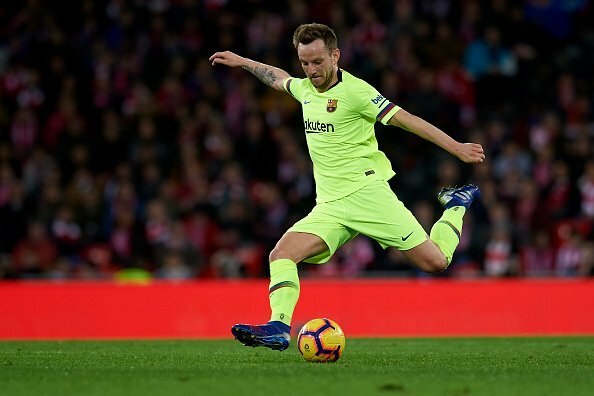 Barcelona’s reluctance to hold on to Rakitic is startling considering the importance he has had on the team since his arrival from Sevilla in 2014. The midfielder has helped the Catalan giants to three La Liga titles, four Copa del Reys, a Champions League and a Club World Cup. This season he has missed just three games across all competitions, racking up four goals – including the brilliant strike against Spurs at Wembley – and six assists. However, half of those assists came in one Copa del Rey match against third-tier side Leonesa. And with the imminent arrival of Frenkie De Jong from Ajax this summer – and the ongoing links with contract rebel Adrien Rabiot at PSG – Rakitic may well find himself gently eased out of the Nou Camp despite his undoubted popularity and success.